It is that time of year again when 5,000 rubber ducks are gearing up to race down the Pequabuck River in pursuit of prizes for their “owners.” Sponsored by the Bristol Chamber of Commerce in partnership with the Bristol Central Athletic Booster Club, Bristol Central Maroon & White Committee, Bristol Central Study Abroad Program, Bristol Education Foundation, Bristol Exchange Club, Bristol Rotary Club, Miss Forestville Scholarship Organization, Mountain View PTO, United Way of West Central CT, and Veteran’s Strong Community Center. 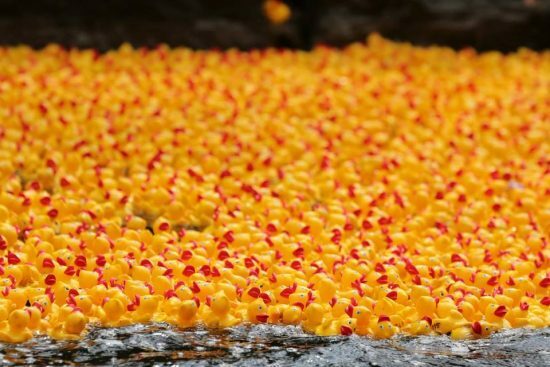 The annual Pequabuck River Duck Race, scheduled for Sunday, May 5th, in Downtown Forestville, raises funds to help beautify Bristol and support our partners. Tickets are sold throughout the community for $5 each with the number of the ticket corresponding to one of the rubber ducks. This year the prizes range from a grand prize of $1,500, $750 for second prize, a 43″ LG Smart 4-K HDTV for the third place finisher and dozens of additional prizes will also be awarded to the top finishing ducks. This all-day event is more than just a duck race, it’s a family fun-filled extravaganza. The day will kick off at 10 a.m. with the a craft and vendor fair, kids game zone, mariachi band, parade, martial arts demonstrations, a live mural painting & more! Food vendors, local businesses, shopping and much more will all be part of the festivities. The duck race itself will begin at 2 p.m. The best part is there is no fee for admission. Tickets can be purchased at the various locations throughout Bristol, contact the Chamber at 860-584-4718 for information. Be sure to get your tickets early as they are usually sold out by race day! For more information and a full list of prizes, visit our website at www.CentralCTChambers.org or the Duck Race Facebook page at https://www.facebook.com/PequabuckRiverDuckRace/.